Full cockpit enclosure, includes the dodger, bimini, rear windows, side windows, mid connector top, and mid connector windows. This is everything you need to fully enclose the cockpit. The boat can still be sailed if you remove the mid connector (to attach main sheet) and mid connector windows. MacGregor 26M companionway dodger. Fits with the winches outside the dodger. 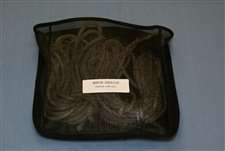 There are zippers that can be used for dodger doors or the full enclosure. Available in black, ocean blue, pacific blue, and cadet grey. Other colors available as special order and not returnable. Stainless quick pins can also be added to quickly and easily remove and install. Most canvas orders take 2-3 weeks to have the product made. PLEASE CALL IF YOU'D LIKE A COLOR THAT IS NOT LISTED. COLORS CAN BE FOUND ON THE SUNBRELLA CANVAS WEBSITE. Sunbrella cloth with clear vinyl windows, rear window set for the full enclosure. This is a 3 piece set. Requires BWY Dodger, Large Bimini (for the M you must also have the stern rail seats), and the mid connecting top. Add the mid connector windows and side windows to make the full enclosure. Center of the rear set zips out or rolls up for ventilation and easy access to the engine and swim ladder. Rear corner sections are cut to fit around the BWY stern rail seats and will be very baggy if your boat does not have the seats. Standard color black, Cadet Grey, Ocean Blue, and Pacific Blue other colors available but non-refundable. Canvas orders may take 2-3 weeks to have them made. Sunbrella cloth and aluminum frame, light weight allows for easy handling. Attaches to BWY Stern Rail Seats. This bimini is not interchangeable with the MacGregor Factory Bimini. Includes zippers for attaching our full enclosure. The back will have 3 zippers. Black standard color, 3 week lead time. Other available colors ocean blue, pacific blue, cadet grey. All other colors non-refundable. Stainless quick pins can also be added to quickly and easily remove and install. This is the only bimini that will work with our full enclosure! If you already have a bimini, before ordering the full enclosure, check to be sure that you have 3 zippers in the back of the bimini, and that the legs attach to the stern rail seats. If not, then call or send us pictures of what you have. If you do NOT have our BWY stern rail seats we can still make a large bimini that fits, please let us know in the options so we can get you the right one. Canvas may take 2-3 weeks to make, call for availability. Frame must be split for shipping, $50 fee. If you are picking up local, please select that option and it will remove the $50 split fee. Sunbrella cloth with vinyl windows. Set of side windows for the full enclosure. Requires BWY Dodger, Large Bimini, Mid Connector Windows and Rear Windows to make the full enclosure. Standard color is black, cadet grey, ocean blue, and pacific blue. Other colors available but non refundable. This does not work with the MacGregor Factory bimini. Canvas orders may take 2-3 weeks to have them made. Nice way to handle your mainsail! This allows you to just lower the mainsail directly into the mainsail cover and zip the top closed. Lazy jacks contain the sail on the way down. Best to use along with halyards led aft. The cover is bolt rope on the bottom which inserts into the boom, the sail becomes loose footed. This means that your mainsail will no longer be completely attached along the foot to the boom. The sail will be attached at the same forward attachment you now have and the Kit includes the outhaul slide you will need to attach at the aft end of the boom. Nicely contains your sail when the boom is removed for trailering. Kit includes two blocks for the mast and all lazy jack hardware. This system requires a notch system in the mast for mainsail loading, this allows the sail to stack all the way down to the boom. If you have the spread mast and sail stop you will need to convert. To convert you will need to close the spread, cut in a notch and purchase a mast gate. To close the spread you will place a 2X4 on top of the spread section on the mast and pound with a hammer until flat. This is a custom order, please specify the color you would like. Takes 2-3 weeks. Sample colors of blue are available, we can just mail these to you. Sunbrella canvas and aluminum frame. This Sport Bimini is smaller for 26M boats that do not have the stern rail seats. Will not work as part of the full enclosure. Order #2201-1M0 Bimini if you want to someday have the full enclosure. Frame must be split for shipping, additional $50 fee. If you are picking up, please select that option and it will subtract the split frame fee. Standard color black, ocean blue, pacific blue, and cadet grey. Other colors available non-refundable. The Sport bimini is built to order, 3 week lead time before shipping. Stainless quick pins can also be added to quickly and easily remove and install. LINK HERE-- Sunbrella Canvas Colors We designed this tarp to be a heavy-duty, but still economical solution for covering your 26M in the off-season. It is custom cut and reinforced, made of 12-mil tarp material which much thicker than cheap hardware store tarps. It has grommets placed all around the key tie down points and comes with tennis balls (to cover the tops of your stanchions). This cover should last a lot longer than poorly fitted generic tarps. Sunbrella cloth with screen windows instead of vinyl is an option for your full enclosure. Shown are the vinyl windows, screen is an option. The screen material is black which makes good sun shade. This is only the first set, port and starboard, windows that zip onto the dodger and the connecting top to make the first set of windows for the full enclosure. You must have one of our dodgers, bimini, and connecting top. Black standard. Windows are made to order, usually taking about a week before shipment. Please note that the shipping method, "next day", "2-day" etc only indicate transit time after the items are shipped, windows will always have some lead time before they're shipped. Sunbrella Jib or Genoa Covers that have small tabs sewn on to lace a string through. You will pull the string tight to prevent the cover from flapping in the wind. These small strings overlap like a shoe lace on the opposite side of the zippers, but they can tangle if you are not careful handling it! This is especially good on moored boats. Built with 3 zippers, just wrap the cover around your sail and hoist it with your jib halyard. Black, Grey, Pacific Blue or Ocean Blue are standard colors but other colors can be special order. All special orders non-refundable. Canvas orders may take 2-3 weeks to have them made. Set of 2 Sunbrella cloth and vinyl windows. These are the windows that zip onto the BWY Dodger and Mid Connector top to make a "Giant Dodger" or use with the rest of the side windows to make a full enclosure. Standard color black, cadet grey, ocean blue, and pacific blue. Other colors available and non refundable. Canvas orders may take 2-3 weeks to have them made. Low profile cover will fit boats that have mast gate covers, not spread. This allows the sail slides to stack all the way at the bottom of the mast track, at the boom level. 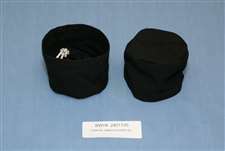 11'6" long Sunbrella cloth cover, black, ocean blue, and pacific blue available colors. Black is usually in stock. Other colors are made to order and may take 2-3 weeks to ship. 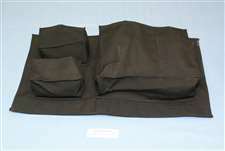 Sunbrella Canvas mainsail cover, its standard factory sail with slides that stack above a sail stop placed above the spread opening. 11'6" long. Boats with a mast gate cover, the notch opening, that allows the sail slides to go all the way down to the boom use our low profile cover #2305-1V0. Black standard color is normally in stock. Other colors available are ocean blue, pacific blue, and cadet grey, 2 to 3 week lead time. Any other color non-refundable. LINK HERE-- Sunbrella Canvas Colors Screen dodger doors with black sunbrella material and black screen. Other colors of material available, ocean blue, pacific blue, cadet grey, but the screen will still be black. Fits same snap pattern as the vinyl doors. Other colors available but non refundable. Canvas orders may take 2-3 weeks to be made, call for availability. LINK HERE-- Sunbrella Canvas Colors Sunbrella cloth and clear vinyl windows. This will zip into the standard BWY dodger. Has a zipper down the middle for easy walk through. Standard colors black, ocean blue, pacific blue, and cadet grey. Other colors special order and are non refundable. Snap pattern the same for the screen doors. Canvas orders may take 2-3 weeks to have them made. Call for availability. Sunbrella cloth hoist up tube cover to protect your sail when not in use or while trailering. Built with 3 zippers so you can wrap it around your sail and hoist it up with your jib halyard. Sheets can come through at the third zipper location, so no need to remove the sheets. When trailering it is recommended to put sheets inside the cover for protection. Some boats may need to add a halyard and block. Black is a standard color and is usually in stock but other colors can be made for you. Please allow 2 to 3 weeks lead time on other colors Special order colors are non-refundable. Recommend Ocean Blue to match the blue hull of the 26M. This picture is of both the 26M and 26X at one of our rendezvous! This will fit the Tattoo 26 as well. Sunbrella canvas top to connect the BWY Dodger to the BWY Bimini. This is needed to make a full cockpit enclosure. Standard color Black, Cadet Grey, Ocean Blue, and Pacific Blue. Other colors available and non refundable. This does not work with MacGregor Factory Bimini or the BWY Tall Bimini, or other brands. Canvas orders may take 2-3 weeks to have them made. New!! The Anchor Shade Umbrella is an easy way to get shade in the cockpit, keeps the morning dew off the cockpit too! Easy to use and easy to stow away. The square umbrella has a locking height adjustment and straps at each of the 4 corners for stability. Stores into its own bag. Great on any boat, but only at the dock. Not recommended while underway. This is a cover to protect your bimini when it is in the folded back position. Made of Sunbrella material. Standard colors black, ocean blue, pacific blue, cadet grey. Other colors non-refundable. 3 week lead time. Canvas pedestal cover for the early "pod style" pedestal. These pedestals were used from 2003-2005 on the 26M and consists of a fiberglass box on top of a stainless pole. The cover is large enough to go over just about any electronics or accessories you may have on the pedestal. It has a bungee-cinch at the bottom to keep it tight. There is the option to have a hole at the top for a mast crutch pole, some of the early 26Ms had the pole going through the pedestal. In later years they moved the pole to the back of the boat, either with a bent rail or an arch style. Canvas orders may take 2-3 weeks to have them made. 26M Bimini cover, Marine Blue. This will only work with our bimini, will not fit Macgregor factory bimini. 26M Bimini cover, Pacific Blue. This will only work with our bimini, will not fit Macgregor factory bimini. Sunbrella canvas with screen mesh front. Sunbrella cloth storage organizer that attaches to a wall or bulkhead with velcro. Has pockets for cups and larger pockets for plates or paper towels. This is a nice convenient way to stow those difficult galley items. Stocked in black. Other colors special order and non refundable. Sunbrella cloth storage organizer that attaches to a wall or bulkhead with Velcro. The top portion is mesh with elastic pocket for small items, chapstick, fingernail clippers, etc. The other pockets are great for TP, sunscreen, and general stuff! All colors other than black are non-refundable. Fits Lewmar #6 winch and new Forespar winches. Stocked in black and pacific blue. Other colors available special order and non refundable. 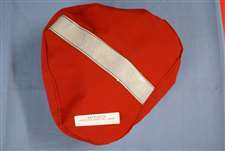 This bright red cover fits Suzuki 50/60/70 3 blade props. Has reflector strip. Improves safety on the highway and protects the prop from minor damage. Used for trailering only. Sunbrella cloth back and mesh front. Good for a few books or magazines or other storage items. Mounts inside. Works great under the table in the 26M. Has 2 snaps. Black Sunbrella colth with a black mesh face. Pocket for your lines, allows lines to dry. Can be snapped onto your lifelines or installed below the winches with snap studs. Could also be used inside the boat to store items. Available with snap flap to go around the lifeline or available without the flap. Specify which you want. These cars attach to the genoa tracks for the standard MacGregor Factory Bimini. Right and Left are different so be sure to specify which side you want. These are not for the BWY Bimini.